Though dated 1996, this kit is considered by most to be the best A-1 in this scale. This happens to be the base boxing of the kit and was reissued in January 2019 much to the delight of fans of the airplane. As one can never have too many A-1s and to help spread out the shipping cost, I bought two of them. Previously, Airfix, Fujimi, and Tsukuda all did the A-1, but this one eclipses those in terms of detail. Molded in medium grey plastic and up to the usual standard of Hasegawa with engraved panel lines, and the use of small poly caps to hold in the prop. The cockpit is adequate with a seat, stick and control panel all fitting into the cockpit tub. Decals are used for instruments. Instructions are what one would expect after all these years from Hasegawa. They include Gunze and some FS 595 color references. Markings are for two planes. One is the CAG bird from VA-52 as shown on the box art and the other is from VA-145 in predominately green markings. Both are in the Light Gull Grey and White scheme. The decals for this particular boxing are the really excellent ones that Hasegawa has been providing in many of its newer models. The white is actually white and the decals come away from the backing in just a few seconds of being dipped in water. 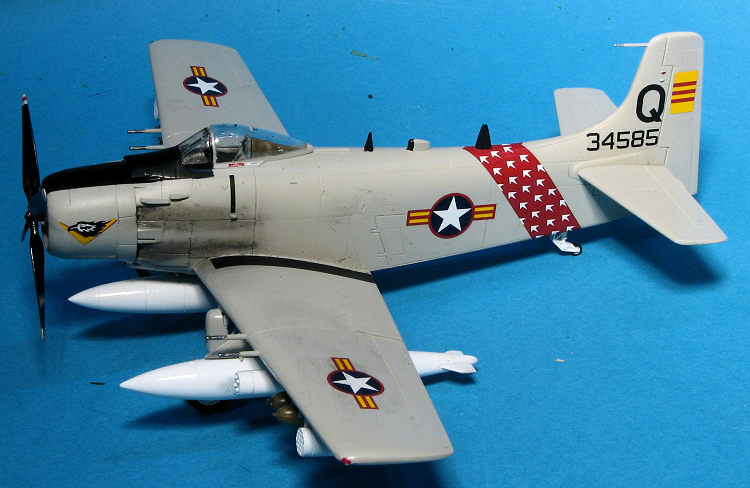 My main reason for purchasing this kit was to use it for the excellent AOA Decals for Vietnamese Skyraiders. Picking the scheme to use is the most difficult part of getting one of these sheets. However, since the kit only provides the Navy wheels, that helped to limit things a bit. I chose an easy way out by deciding to concentrate on an overall grey plane. AOA's instructions are top rate so the first thing I did was to remove the unneeded antennas and fin tip light from the kit. Then the interior bits were painted dark gull grey and the decals applied to the various panels. These worked just great. I then assembled the three fuel tanks. I'm not sure which I'll install, but it is best to have them all done ahead of time. I also went looking for ordnance as the kit's offerings of rocket tubes is fairly lame. The cockpit was then installed into the fuselage halves as well as the lower intake and the halves closed. I also assembled the wings at this time. The wings were then attached to the already sanded down fuselage. Fit is quite good though I had a small gap at the aft wing/fuselage join. I also attached the tailplanes and glued on the upper intake piece. After a bit more filler and sanding, I built up the engine and after painting it attached it. I did not use the engine cover piece as that was often removed on land based planes. The rest of the cowling was attached as were the cowl flaps. These latter pieces do not fit quite as well as I'd have hoped. The seat had some tape belts attached and was inserted into the cockpit. I then masked the windscreen and canopy and glued them in place. Flipping the airframe over, I started attaching the various pylons. The smaller ones are individually numbered, but they all look the same. Regardless, I glued them in the order provided. I also attached the larger fuel tank pylons and the centerline pylon. This was a fairly tedious job and naturally, I lost one of the tiny anti-sway braces. I then painted the wheel wells white and filled them with Silly Putty. Wasn't really sure what to do about the tail hook well. Ground based planes did not have a tail hook but they may have left the attachment point. I eventually cut the kit hook shaft where it went into the attachment point and cemented that in place if for no other reason than to fill the attachment hole. After masking and attaching the canopy and windscreen, I filled the engine opening with the aforementioned Silly Putty and headed for the paint shop. For this build, I decided to use one of the early South Vietnamese Air Force planes, hence the trimming of a few items not used on their planes. I chose a scheme that still used the Navy wheels and had a fuselage band. This aircraft was listed as overall light gull grey. I thought this was a tad odd as they came from Navy stocks, but indeed, photos in the book VNAF 1945-75 showed that there were quite a few of these overall light gull grey planes. This, of course, simplifies painting the airframe and I used Testors Model Master enamel for this. The large tanks were still white so those and the landing gear bits were painted this shade using Tamiya gloss white. Meanwhile I started hunting up appropriate things under the wings. When it came to bombs, from the look of it, they carried WWII era bombs and not the more modern Mk80 series. I used two sources for ordnance. One was the Hasegawa Weapons Set #1 for the rocket pods. 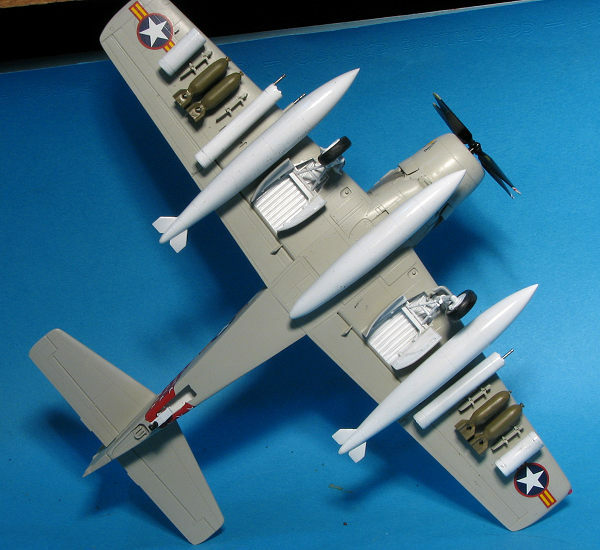 The bombs came from the Airfix B-25. I cut off the mounting lugs so they'd fit on the pylons. 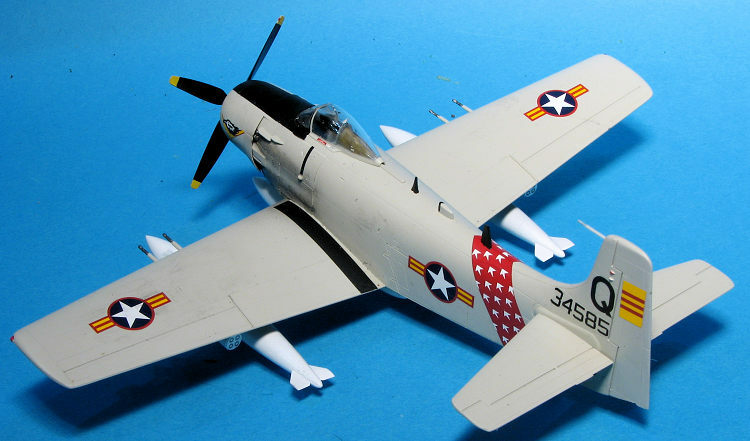 The decals were AOA's recent 1/72 Skyraider sheet for VNAF planes, #72009. I used the very first option as much for the colorful fuselage band as anything else. The decals are printed by Microscale and while very good, you have very little working time with them before the glue seems to go away. They come free from the backing in seconds which is nice, but if left there for too long, will stick to the paper backing. These need to be dunked then applied one at a time, for once the glue is gone, it won't stick well to the model. With all the markings eventually in place, I continued with some painting and assembly. The prop has red/white tip markings on the front and yellow on the back. I used a decal for the red stripe. Then I started adding things like gear doors, wheels and other antennas. These planes had a large rear blade antenna that the kit does not provide so it needs to be made from card stock. Then it was time to provide a clear coat. The light gull grey of the time was matte so a matte clear was applied. I then did some exhaust stains. I really am terrible at doing these. Then time to add weapons and tanks. For those who may not have build this kit, the pylons have small holes in them to accept the little nubs on Hasegawa weapons from the set. These are very handy. I picked my pylons at random, leaving a few 'gaps' between weapons. Then there was a bit more detail painting and the masking was removed from the canopy and I was done. 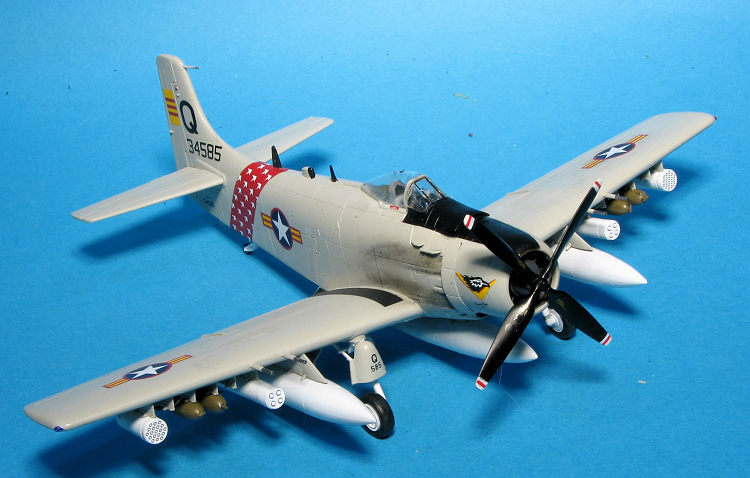 This was not the first Hasegawa Skyraider I've built nor will it be the last. They are nice kits that, with the usual care in building, will turn into equally nice models. They are also kits that tend to sell out rather quickly when reissued so it is worth picking up a pair (as I did) when they are re-released. The AOA decals are very nicely done and worth getting if you are wanting to do a VNAF plane in any scale. VNAF: South Vietnamese Air Force 1945-75, by Jim Mesko, 1987, Squadron/Signal Publications. Thanks to me for providing this preview kit for your added education, and AOA decals for the sheet.